The breed history of the varieties and coat colour genetics of the Belgian Shepherd Dog. This book presents, in a simple and structured way, a study on coat colours and textures. It takes into account recent results obtained by molecular genetics. There is also a chapter on matings between the different varieties. Illustrated examples make it easier to understand. The standardised nomenclature for coat colours in dogs is also included. This in-depth study is preceded by a summary of the historical evolution of the Belgian Shepherd Dog varieties since the foundation of the first club in 1891. 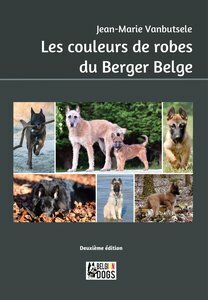 The five periods in the history of the Belgian Shepherd and the seven Breed Standards are reviewed. Putting history and coat colour genetics side by side makes interesting food for thought. He recibido el libro correctamente. Muy bueno. Muchas gracias.